The application allows to send the public messages, all Windows Communicator users will see that messages. You can also send a private message to any user who is online or offline - this user receive the message immediately after logging on to the communicator. In addition, the application allows you to create proprietary channels (for selected users) or open channels available to everyone. Only channel members can see the channel messages. Another type of message is pop-up message. This kind of message gives you an ability to create a rich text using text editor. Formatted text can be send to any number of users, recipients receive the pop-up window with the message (offline users receive it immediately after log on). The application allows you to send files to users, both those who have enabled Windows Communicator application, as well as those who have turned off the program - will receive the file immediately after starting the program. Administrator can give an access to getting screenshots from any workstation running Windows Communicator. The Server service is binding on all users of Windows Communicator, manages the flow of files, messages, controls the Windows Communicator Webchat Service. Administrator using the Server Manager application adds users who can connect to Windows Communicator server, configures their access for remote screenshots, run remote programs, can customize certain features of the communicator client (hide certain options). 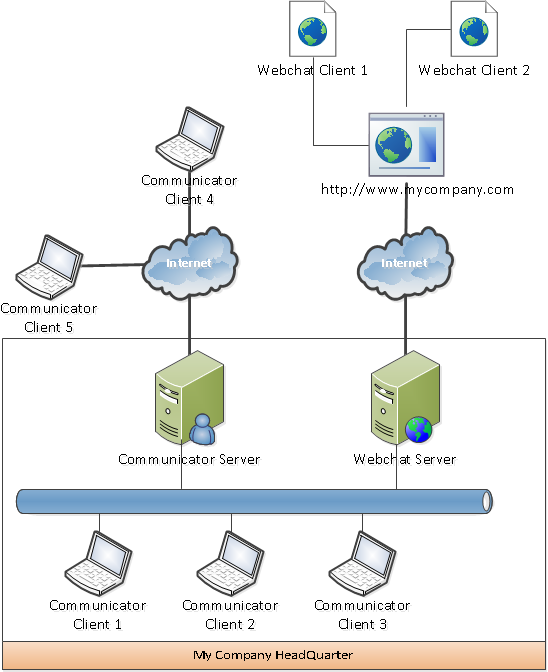 Additionally, the tool allows you to configure working hours for Webchat services, Webchat messages, the number of concurrent connections for a single communicator user. The service allows you to put on your own website tool that allows to communicate with Windows Communicator users. Messages placed in the Webchat will go to those communicator users , which the administrator appointed to handle such messages.